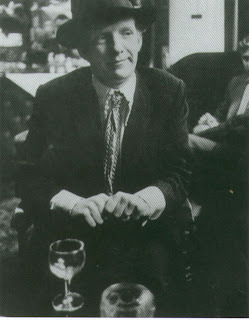 Christopher Gibbs in 1966 wearing a jacket from Hung On You. Antique dealer Christopher Gibbs was one of the central figures of the Chelsea Set in 1960's London. Known for his immaculate style, he was a sartorial influence on many menswear designers such as Mr. 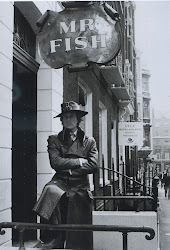 Fish, Rupert Lycett-Green (Blades) or Michael Rainey (Hung On You) and other of his famous friends such as Mick Jagger or Brian Jones.Gibbs was described by fashion historian Nik Cohn as one of the most avant-garde dressers in Britain - reportedly, he was the first man in London to wear flared trousers as a fashion statement (as early as 1961). 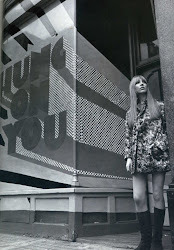 Interviewed by fashion writer Paul Gorman , he talks about his life in 1960's Swinging London: I know it's a cliche to say, 'If you remember the 60's, you weren't there', but I definitely suffer from the blown-mind syndrome. The only thing I'll say in my favour is that I was practically the only person I knew who actually went to work at nine o'clock in the morning, whether I'd been up to eight o'clock or not, because I had a job, my own business, and I realised that, if I didn't, I wouldn't have any of those things (Paul Gorman, The Look - Adventures in Pop and Rock Fashion, p 77). Gibbs came from an upper-class family. He was educated in Eton (although he got expelled) and at the Sorbonne in Paris. From 1958 onwards he was making numerous trips to Morocco, during which he accumulated a large collection of garments and antiques. 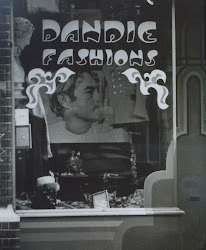 Around the same time, in the late fifties, he started his antiques shop on Sloane Avenue in Chelsea. 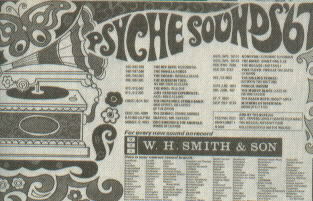 Being a shopkeeper, I used to sell things sometimes. Then I used to parade around in them - he says, before modestly admitting: Yes, maybe I did have an effect on a few people (Gorman, p 77). 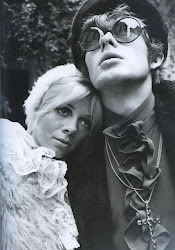 By mid - 1960's, Christopher Gibbs had become a style leader, a Swinging London's Beau Brummell. 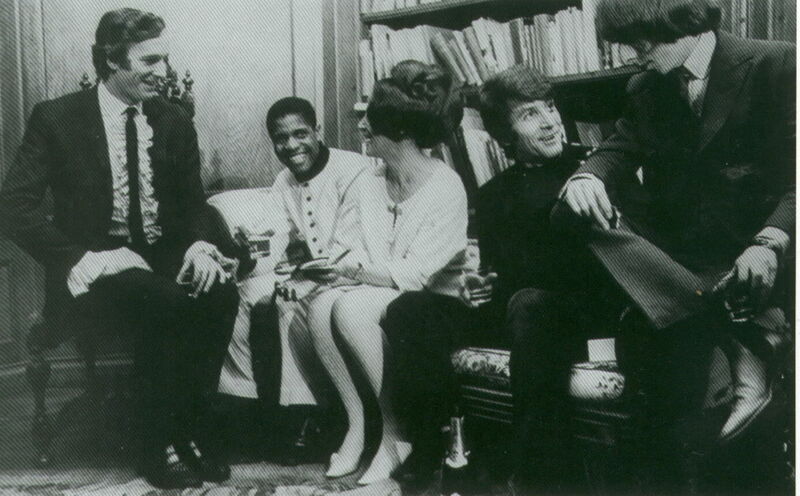 At the time his regular hangout of fellow dandies included interior designer David Mlinaric, owner of Dandie Fashions Tara Browne, owner of Hung On You Michael Rainey (and his brother-in-law Julian Ormsby-Gore), and upper-class socialites Neil Winterbotham, Mark Palmer and Nicholas Gormanston. 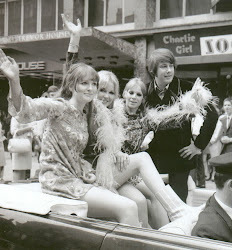 You had to be monumentally narcissistic and have time on your hands, and just about enough money to do it (Gorman, p 77) - said Gibbs about being a dandy in 1960's. In those days he would often call one of his stylish friends, and spend as much as forty minutes discussing which ties should they wear for a night out. Forty minutes spent on a tie - not even Brummell could call that sloppiness - wrote Nik Cohn in Today There Are No Gentlemen. Gibbs was the original 'Peacock'. He was a big influence not only on King's Road designers, but also on Rupert Lycett-Green of Blades and Mr. Fish. His position as a style guru was assured when he became an editor of shopping guide in Men In Vogue - first ever male edition of this famous fashion magazine. 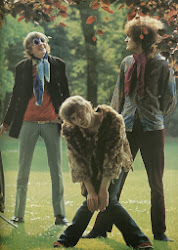 Men In Vogue was published quarterly between 1965 and 1970, and it coincided with 'Peacock revolution' in English male fashion. 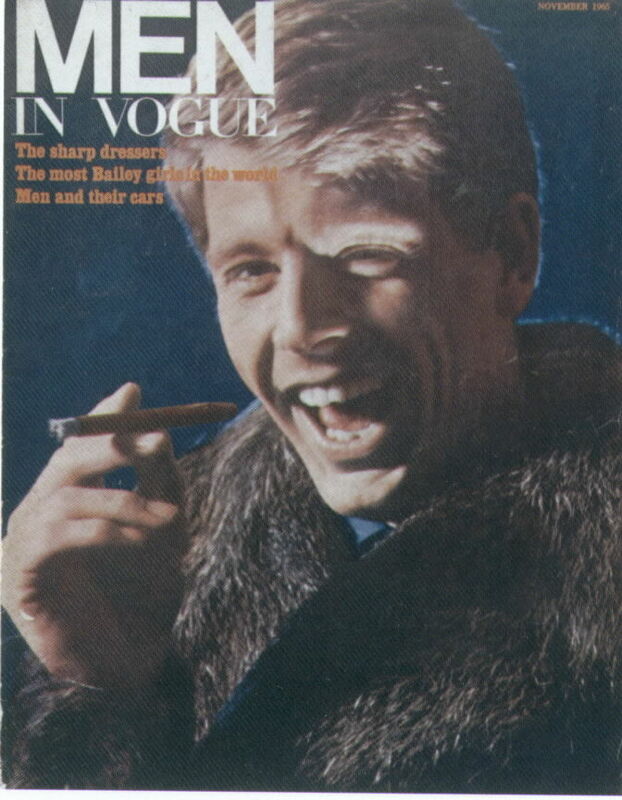 Actor Edward Fox (brother of James Fox) on a cover of first issue of Men In Vogue published in November 1965. 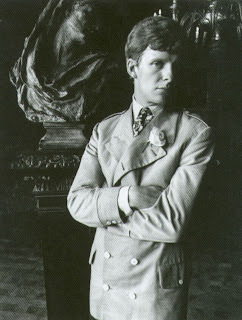 Christopher Gibbs in the same issue of Men In Vogue. The double breasted jacket is from Blades. In his impressively furnished home in Cheyne Walk, Gibbs absorbed his Montesquieu, Beau Brummell and Beaudelaire and determined to adapt their aesthetic sensibilities to contemporary style (Gorman, p 77). 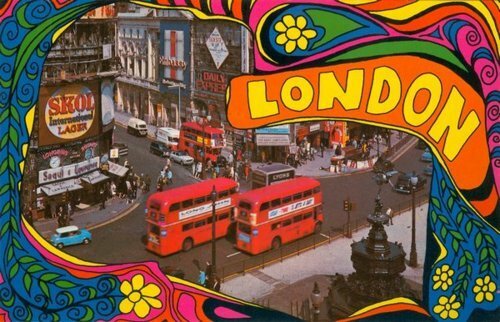 his home became 'a place to be' for anybody who was anybody in Swinging London. 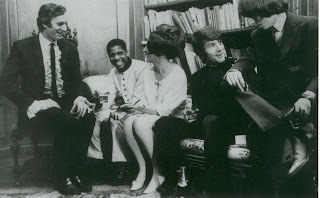 Party at the home of Christopher Gibbs with fashion designer Mr. 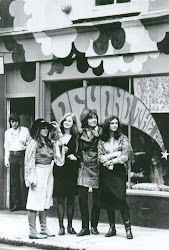 Fish (far left) and interior designer David Mlinaric (far right), 1966. 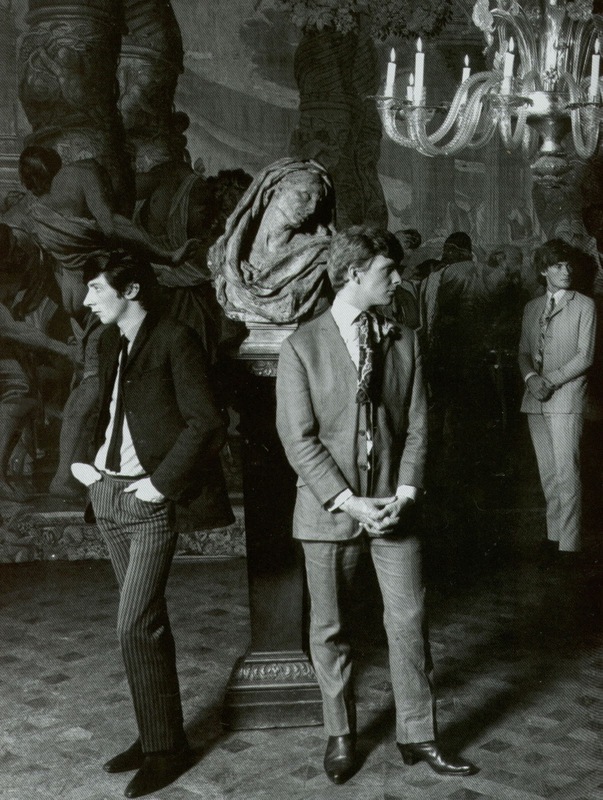 In 1966, Gibbs's Cheyne Walk home was used by director Michelangelo Antonioni as a set for a marijuana-smoking party scene in Blow-Up, where completely stoned model Veruschka tells David Hemmings probably the most memorable line of the film:" I AM in Paris!". 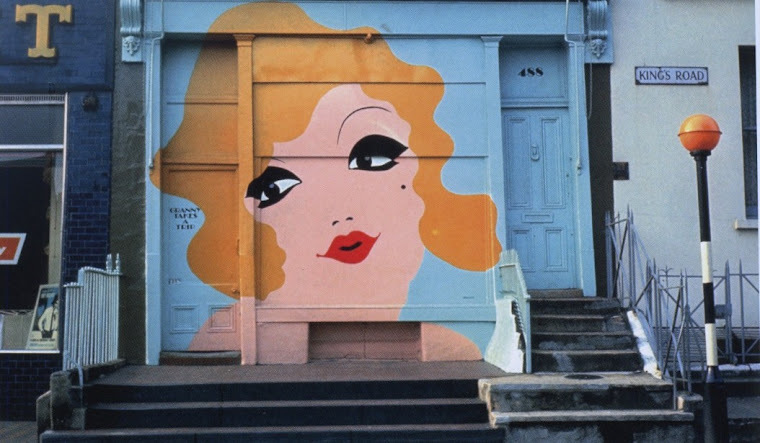 Avant-garde film director Kenneth Anger also used Gibbs's home to shoot some of a scenes of his infamous masterpiece Lucifer Rising there in 1971. Gibbs was also a close friend of Mick Jagger, Keith Richards, Brian Jones and Anita Pallenberg. 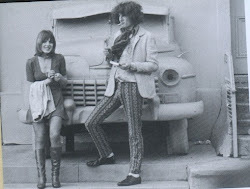 In 1967 he took them to Morocco. 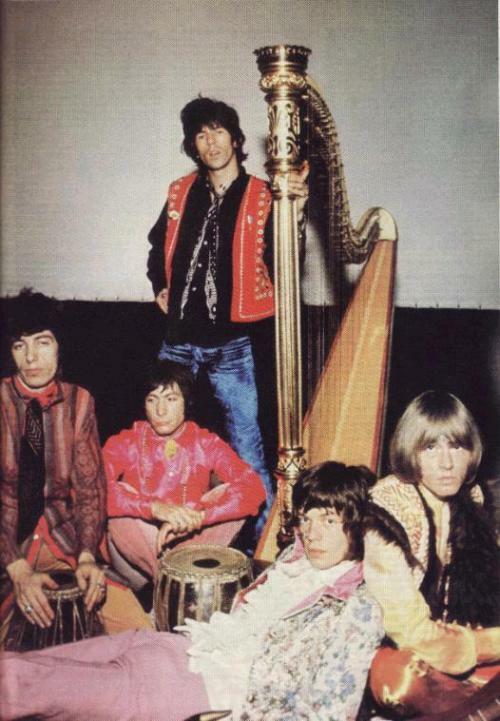 The trip was a tremendous influence on all of them, especially Jones, who recorded an album with Moroccan musicians Masters of Joujouka, and introduced african elements to his already very flamboyant look. 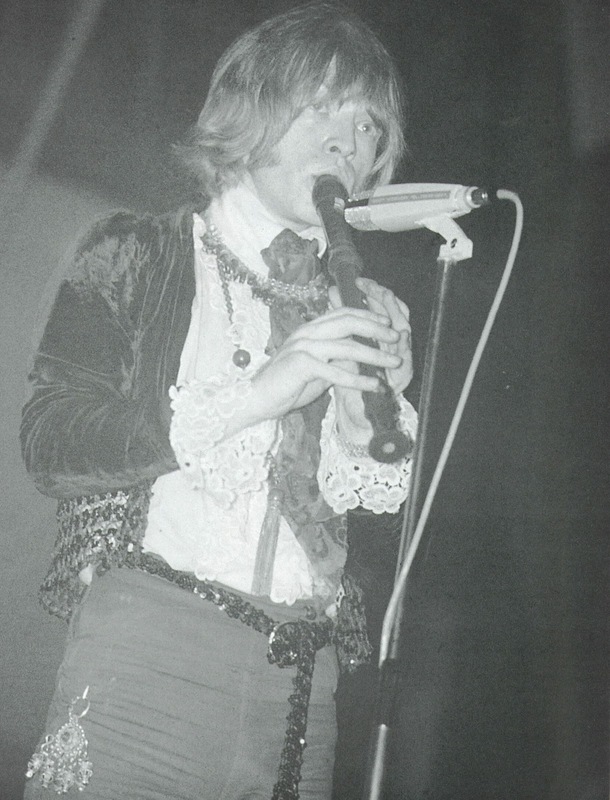 Christopher Gibbs was an important part of a group that sparkled off a Peacock Revolution. 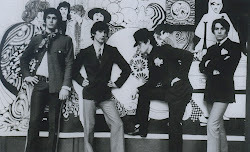 The group consisted of upper class socialites, fashion designers and flamboyant pop stars.In a rapidly changing world of 1960's London, these young men, through the peacock style, re-invented the idea of dandyism, echoing the words of writer and poet Charles Beaudelaire who wrote in 1836: Dandyism appears especially in the transitory period when democracy is not yet all-powerful, and when aristocracy is only partially unsettled and depreciated. In the confusion of such periods, some few men who are out of their sphere, disgusted and unoccupied, but are all rich in natural force, may conceive the project of founding a new aristocracy. Great post, thanks for sharing this! 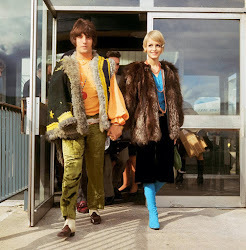 I'm really keen on reading more about 60s men's fashion - are there any books you would recommend? 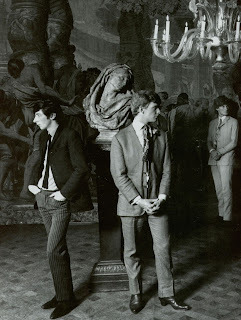 Unfortunately, 1960's male fashion, although a fascinating subject, seems to be a bit neglected by fashion history. The best book ever written on a subject - "Today There Are No Gentlemen" by Nik Cohn (1971) has been out of print for decades. I managed to get hold of a copy, and I quote it a lot in various posts in this blog. I quote these authors frequently in my blog, and I also have used a lot of pictures from these books. 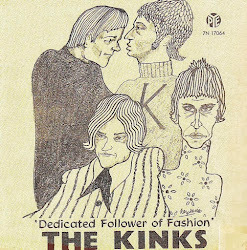 I'd recommend them as a 'mandatory reading' to anybody interested in 1960's male fashion. Thank you so much for listing all these books, they've just moved on top of my Christmas wish list! Christopher Gibbs is also responsible for the interior sets in the film Performance. Carefully picking out odd Moroccan and African items. 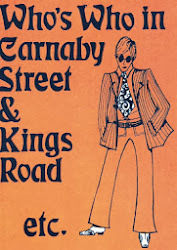 For anyone who has access, both Westminster Reference Library on Leicester Square, and Chelsea Library on the Kings Road have excellent books available on fashion and costume, some on the 60's. Thank you so much for listing those books, they will be a great deal of help to me in my thesis! Fab article, love the Ormsby-Gore photo! !